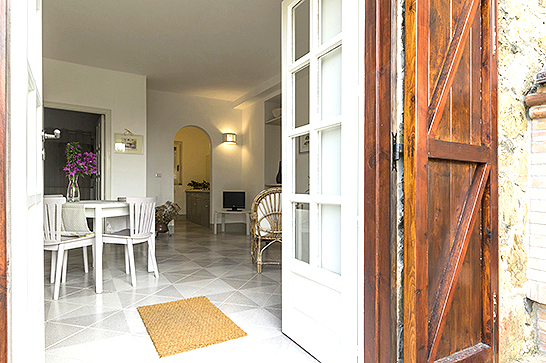 The breath of the Provence seems to flow through this completely redesigned holiday apartment in Località Paradiso near the town of Santa Maria di Castellabate. 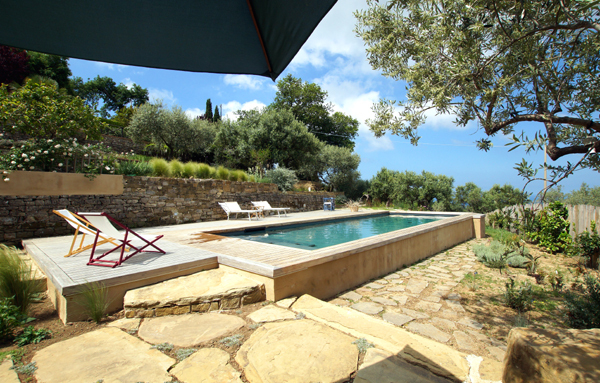 Realizing the literally paradisiacal design of the rambling premises with pool was a matter of genuine importance to Maria, the owner, who was born in France. Mediterranean plants and gnarled olive trees provide a nice contrast to the blue shimmer of the nearby sea, which, from the terrace, is always within your view. The holiday apartment may well be called stylish. Light hues and distinct lines make for a pleasant and cozy atmosphere. 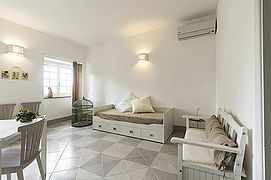 The apartment includes a spacious living-dining room, a kitchen, a bedroom and a bathroom. 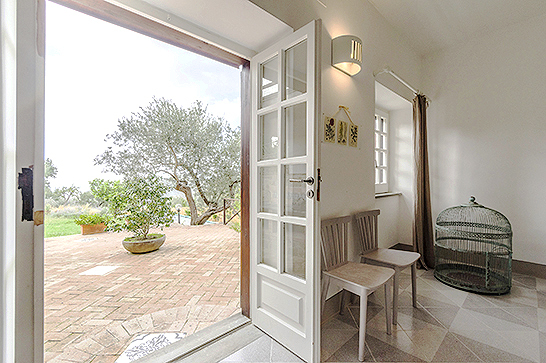 In front of the living room, which you find yourself in when entering Il Giardino degli Aromi, there is a spacious and very well-tended terrace. 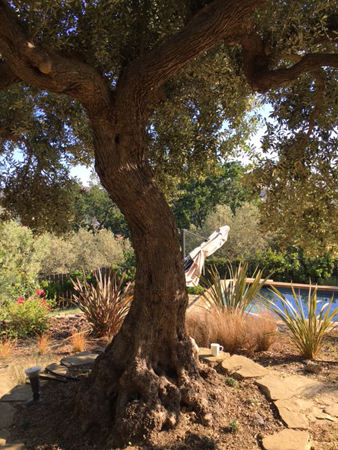 An old olive tree offers pleasant shade on warm days. A sunshade, a wooden table and chairs, loungers and a stone grill create an inviting outdoor ambience. 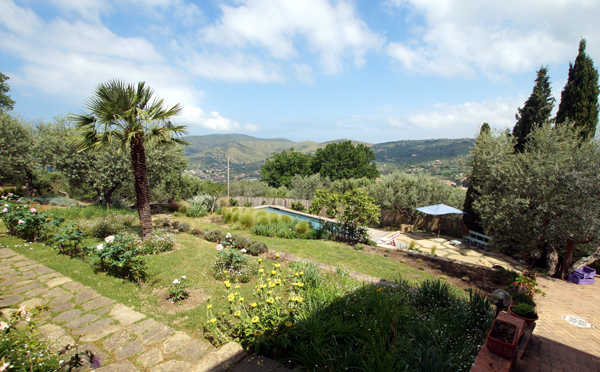 From the terrace, you have got a good view of the whole pool area as well as the evergreen hilly landscape of the northern Cilento. The sea stretches away on the horizon. On very clear days, you can even see as far as the Amalfi coast with the Isles of Capri and Ischia. 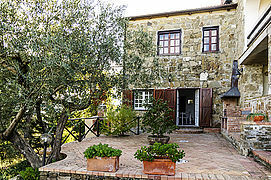 Il Giardino degli Aromi accommodates up to three persons. The bedroom is furnished with a double bed; for the third person, there is a sofa bed in the living room. The latter also includes dining furniture, TV and a bench. 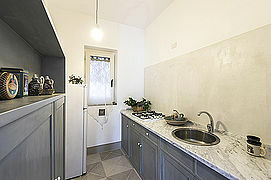 The adjoining open kitchen is equipped with gas stove, mobile oven as well as refrigerator with freezer compartment. 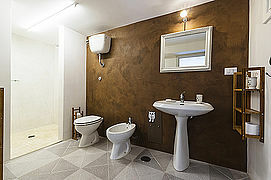 What catches your eye in the bathroom, which is accessed via a small staircase, is the large masonry shower cabin in very modern fair-faced concrete design. Of course, there is also bidet and WC. 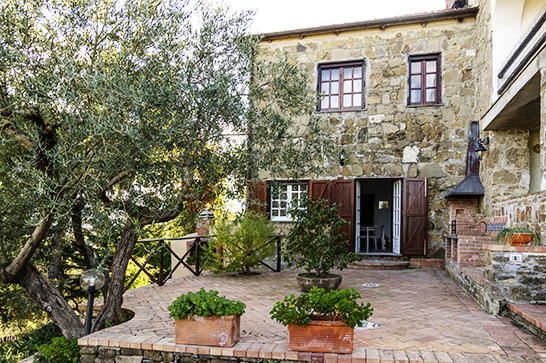 The owners’ apartment is on the upper floor of the lovely quarry stone house; they use it for short stays during the summer months only. The pool (ca. 4.5 m x 11 m), a pizza oven as well as a washing machine (in an extra room above your terrace) are, therefore, for shared use. The marvelous view of the sea, which you also enjoy from the pool area, is a special highlight. Upon request WiFi is available in the apartment. 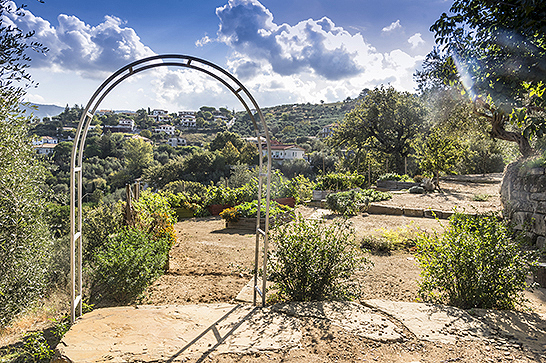 Il Giardino degli Aromi is only about 3 km from the famous mountain village of Castellabate, which is not only a UNESCO-listed World Heritage Site, but has also been the setting of a movie. 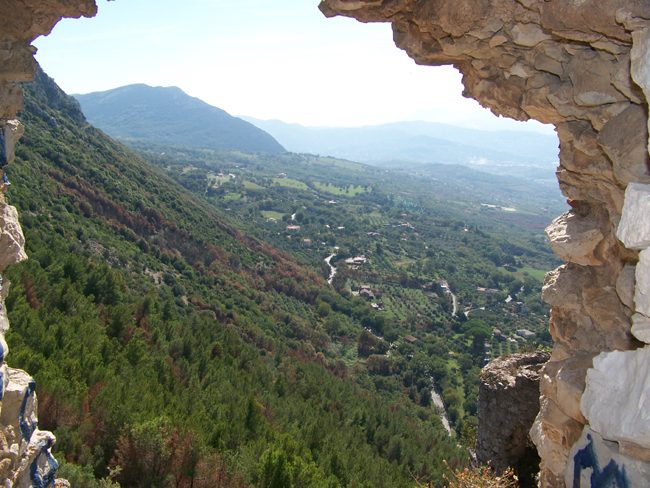 You should not miss out on strolling through the narrow alleys to the belvedere of the village. It is only a few kilometers to the coastal town of Santa Maria di Castellabate. 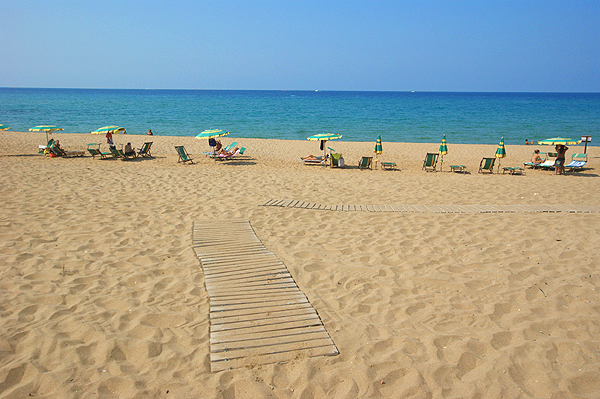 A lively seaside promenade with bars and restaurants and golden sandy beaches await you there. 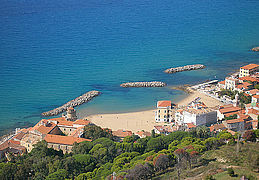 The sandy beach closest to the holiday apartment is found in the district of Lago (ca. 4 km). 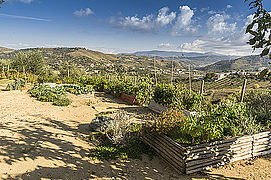 Small grocery stores, a butcher’s and a bar which offers lunch specials are about 900 m from the apartment. 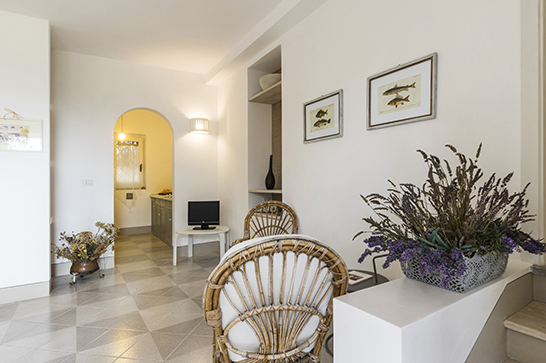 The fact that the coastal towns of Santa Maria and San Marco di Castellabate have, to this day, remained active fishing villages becomes apparent in an impressive way especially in May. For a whole month, during the „Festival delle Arti Marinare“, the communes concentrate on their old seafaring and fishing traditions. There are numerous cultural events, but also small markets which offer degustation. 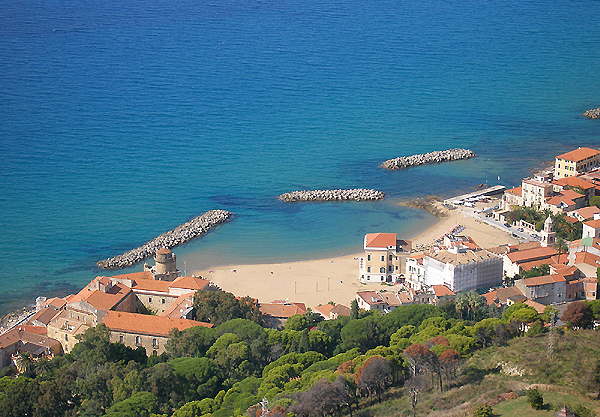 Nearest train station: Agropoli-Castellabate (ca. 10 km). 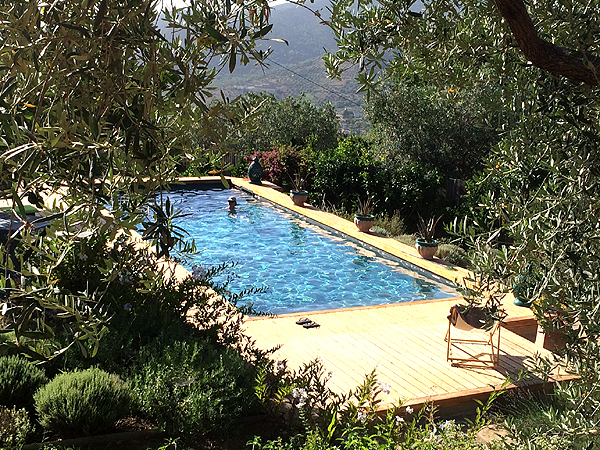 View from the pool area of holiday apartment Il Giardino degli Aromi – it always puts a smile on your face. 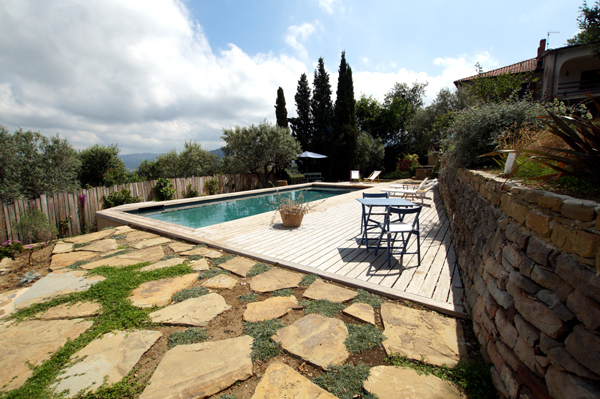 The pool was built in 2014 in best panoramic location. The estate fits perfectly in the beautiful landscape. 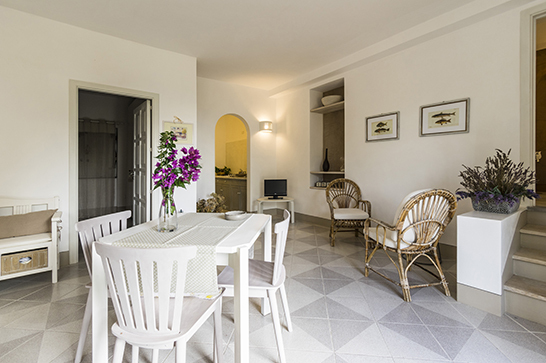 With a bit of luck, you can see as far as the Amalfi coast from the spaciously laid-out terrace. The living-dining room, which is held in light colors, is the heart of the apartment. 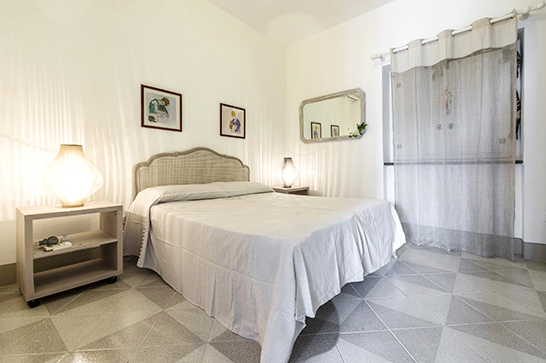 The bedroom of Il Giardino degli Aromi with double bed and air conditioning. Eye catcher in the modern bathroom – the shower. The kitchen of the holiday apartment is small, but fine. Golden sandy beaches await you in the district of Lago. 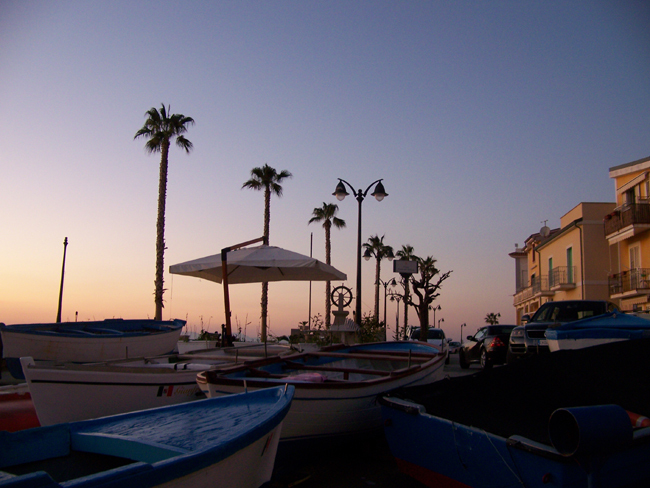 Santa Maria di Castellabate is a lively town and ideal for bathing, strolling, savoring and shopping. Enchanting play of colors in the large garden of the holiday apartment. The pool at the lower end of the premises is ready for a relaxing wellness-session. 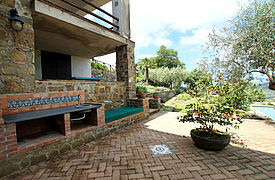 The quarry stone façade fits well into the Mediterranean premises. The entrance area of the holiday apartment. Glance from the living room onto the terrace and the impressive olive tree. The TV 'corner' in the living room, in the background the open kitchen. The living room with sofa bed for the third person. 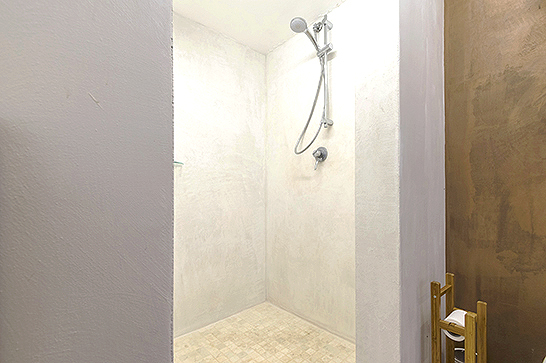 The large shower cabin made of fair-faced concrete. 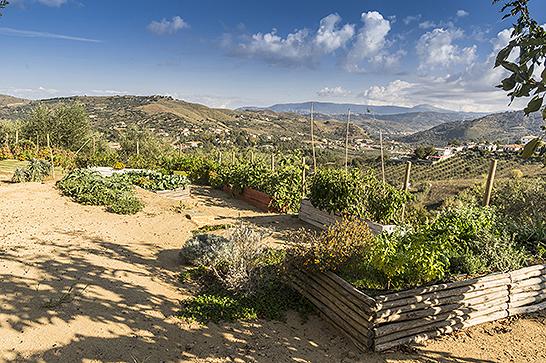 In 2014, a vegetable garden was laid out at the back of the house. 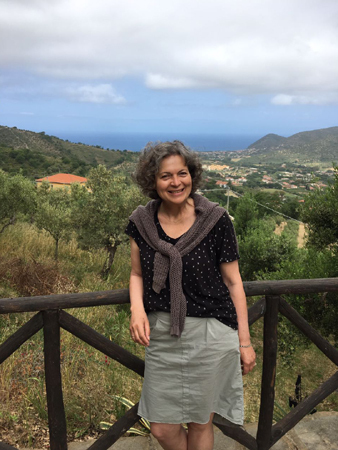 Was uns im Cilento besonders gut gefallen hat, waren die Landschaftsvielfalt, die tätige Bewirtschaftung (Olivenernte), die gepflegten Dörfer und die Historie der Region. Die Unterkunft befindet sich in einer hervorragenden Lage und besitzt einen tollen Garten. 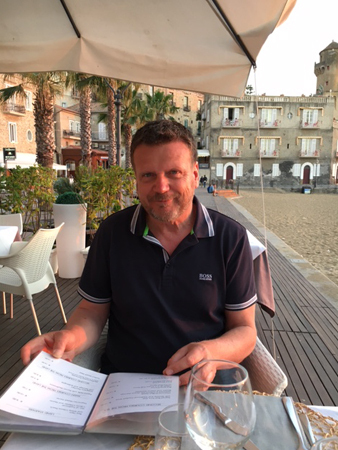 Unser Geheimtipp ist die Pasticceria Toretta in San Marco di Castellabate. Sie befindet sich am Ortseingang an der Hauptstraße und führt ein exquisites Angebot zu einem top Preis-Leistungsverhältnis. Es gibt noch endlos viel zu entdecken – wir kommen auf jeden Fall wieder! 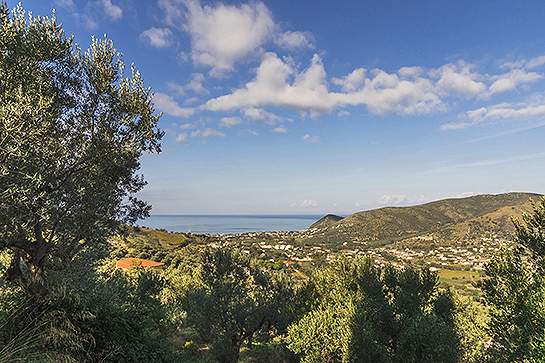 Die Region um Castellabate, mit dem Meer und den Bergen unmittelbar nebeneinander, ist einfach wunderschön. Auch unsere Ferienwohnung war sehr schön, hat einen wunderbaren Garten mit Pool und einen sensationellen Meerblick zum Sonnenuntergang. Außerdem hat uns der Vermieter sehr gut unterstützt. Kurzum: Schöne Gegend, sehr gute Unterkunft – wir kommen wieder! Es war ein rundum gelungener Urlaub mit vielen schönen kleinen Erlebnissen und Eindrücken. Wir haben absolut nichts zu beanstanden. 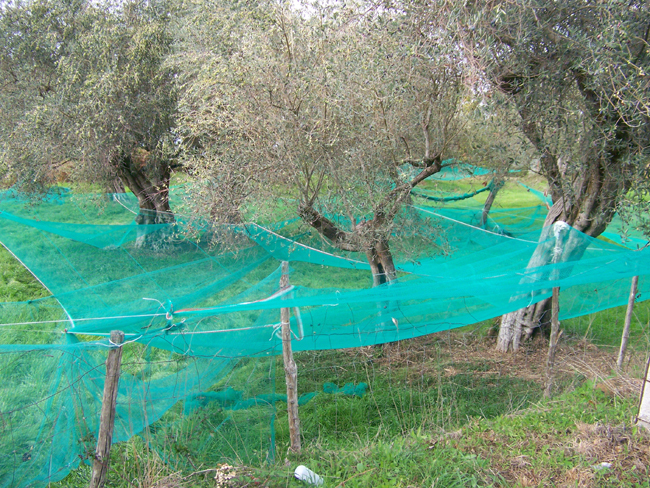 Besonders gut gefallen haben uns die Landschaft, die Menschen und dass man dort wirklich das Gefühl hat, in Italien zu sein. Alles ist sehr authentisch. 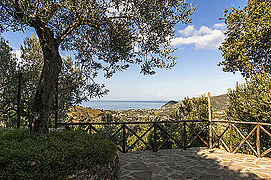 Die Ferienwohnung befindet sich in einer sehr ruhigen Lage und bietet einen herrlichen Ausblick auf`s Meer. Toll waren auch die netten Gespräche mit unserem Vermieter. Man hat sich jedes Mal nach einem Ausflug oder nach auch nur kurzem Wegsein gefreut, wieder zurück zur Unterkunft zu kommen. Abgesehen von der schönen Gegend gibt es dort noch so viel zu sehen, was wir in den wenigen Tagen leider nicht geschafft haben. Deshalb werden wir sicherlich noch einmal hierher kommen. Empfehlenswert! Der Garten, der Pool und die Ruhe auf dem Grundstück sind einfach herrlich! Auch das ursprüngliche Italien hat uns super gefallen und wir möchten es noch besser kennenlernen, daher kommen wir sicher wieder! Costs for air conditioning: € 50/ week (when used payable on the spot). Costs for WiFi: € 10/ week (when used payable on the spot). Pool open: May 15th – Oct. 15th (changes due to weather conditions possible).